Charles, Sean, and Chris on the PCT 2012: 20 July - Day 90 - Mt Shasta in all its glory! 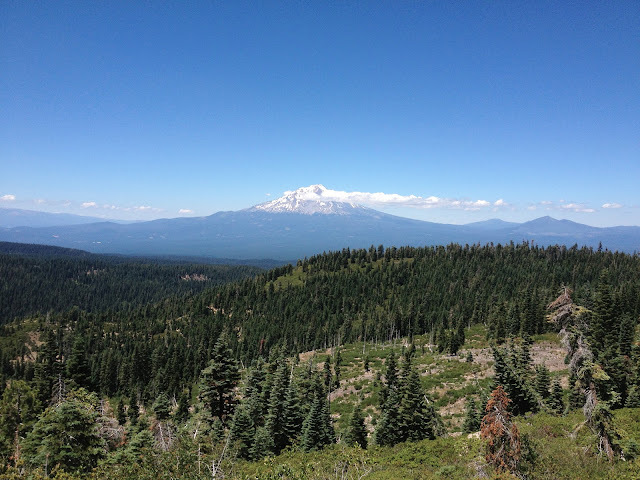 20 July - Day 90 - Mt Shasta in all its glory! Wake up to wet sleeping bags and gear! Heavy dew atop the mountain overnight. Yuck. Pack up after coffee, then on we go. But what views of huge snow- and glacier-covered Shasta! So impressive. We think each one is the best possible. Then, wow! The trail hugs high rims and ridges for half the day giving us an easy hike in the 7000-ft elevation range at first, surrounded by Douglas-fir and white fir. The path quickly enters woods that are lusher and greener! It's been getting this way ever since leaving Burney Falls, but today is more so. Soon the trail is crowded and overgrown by lush growth of underbrush and flowers. The bracken fern is 4 ft tall at times. The white lilies are sometimes taller. Wow. As we hike west across the rolling mountains of the Cascades towards the Siskiyou Range, the woods look more like Pacific Northwest (and pan-boreal north hemisphere) wet montane. We are hiking through logging territory now. We stopped around lunch, laid out our sleeping bags, our tent footprints, etc. It looked like a gypsy's yard sale. We ate and took a quick nap. Trail dropped to the 5000-ft range, then plunged down, down, down to below 3000. Such deep beautiful woods -- with towering Douglas-fir reaching impossibly high. We were now entering a moist west-facing river valley, and the life is luxuriant. Creeks and springs are delicious. But the air got warmer as we descended. One of our biggest-mile days so far. Having accomplished 32 miles of hiking, we stumbled into camp after dark -- very footsore, and not at all patient with the two rattlers already lounging in our campsite. Campfires from car camping tourists lit up circles of steep forest above the roaring creek below. I thought maybe another campsite would be better, since there had been rattlers in the first we tried. So I left Dionysus and Seano resting, and went down to check out the next one. I tottered and weaved as I walked (your body loses the ability to balance without the backpack on, after a 32-mile day). Why didn't I take my headlamp? It was getting dark fast. I could make out the flatness of the ground -- the lay of the land -- with trees all around, but couldn't make out the details of what was on the ground. I bent over to see if this was a branch on the ground in front of me that I could reach down and tug out of the way, then I thought of rattlers and stood up suddenly -- and lost my balance and stepped back. Right at my feet the buzzing of a rattler erupted, and I did a high-stepping, knees up under my chin, frantic dance trying to get away. I'm not sure, but I think I stomped the poor rattler to death because I couldn't get my balance stumbling around and it suddenly stopped buzzing. I left that campsite at a run (ooooooh, my legs didn't want to run), and returned to our first spot where Seano & Dionysus waited. "Well," they asked. "Was that spot any better than this one?" "No, not really. I guess this one will do okay. Let's set up our tents, though, and zip them shut. Y'know. So nothing crawls in at night." We set up camp, staggering around and pretty irritable. PS. Getting up to pee in the night this time involved the unusual addition of a headlamp. 28 June - Day 98 - from Etna to Cowbells! 23 July - Day 93 - Zero day in Shasta. 22 July - Day 92 - Shasta Town! 21 July - Day 91 - Happy Birthday, Dionysus!